"How your car reacts with the pavement is just as important as how the vehicle reacts to you"
One should never have to sacrifice durability for beauty. Our philosophy is built into every steering wheel we make. Car Enthusiasts spend a great deal of time fitting high performance engine components, tires, suspension, and exterior aero with quality aftermarket parts. Changing the dynamic of how you connect with the car in every twist and turn has has lead us to bring our Bespoke Racing Wheels to the community. We truly believe the best way to change how you feel about the car starts with the simple process of how your hands touch the wheel. You've got me hooked, tell me more..
Quality materials with top notch craftsmanship give us not only the advantage with cost and production time but also the unique ability to customize a racing wheel to your specifications. We start the process by taking a new or used donor wheel and remove the old materials ensuring we start with a blank canvas. Scoring the cores to ensure a lifelong endurance to all aspects of seasonal and driving abuse. Then we use Top Grain Leather or 1.01mm Alcantara hand cut from a yard roll specific to your exact wheel and request. Using a 1-2-3 cross/web stitch method we then use a color chosen (up to 3 colors total) to perfectly secure the material to the wheel. Trimming the wheel to outstanding closeness for an OEM look and supurb feel. Finally we mill off a small section of the bottom that does not compromise the integrity of the core for the final stage of finishing, Carbon Fiber. Prior we sourced a vendor out of Yokkaichi Japan but now we do all our own fiber working in house. This saves time and increases the beauty of our craft. The last step is when the craftsman hand engraves his signature to the center section (not visible externally) and applies a serialized sticker for authentication and quality assurance. You will know if you have a real Nelson Racing Wheel or a cheap knock off instantly. The material was developed in the early 1970s by Miyoshi Okamoto, a scientist working for the Japanese chemical company Toray Industries. Alcantara has succeeded in establishing itself in this sector as the ideal partner for turning car interiors into exclusive, comfortable settings while guaranteeing absolute compliance with the industry's strictest standards. This is why you see this material in the top car manufacturers, giving added feel to the world's most iconic cars. Available in several color options by request only. Having been treated to ensure a smooth, non "catching" feel, we use a top grain that has been split to perform under intense circumstance. Wear resistance of real leather is second to none in the auto industry and knowing the difference is why our customers select our services. Our leather is not only 100% real but treated using the Chromium method with a pH 3.8 and 4.2. Available in several color options by request only. A more breathable and enticing option for the daily driven BMW Race Car. Using the premise for our Real Leather we offer it with perforation to keep quality top notch while also giving you added breathability for vapor moisture to exit the material. Available in several color options by request only. What Wheel do i have? Our fiber working has gotten some rather good notoriety. 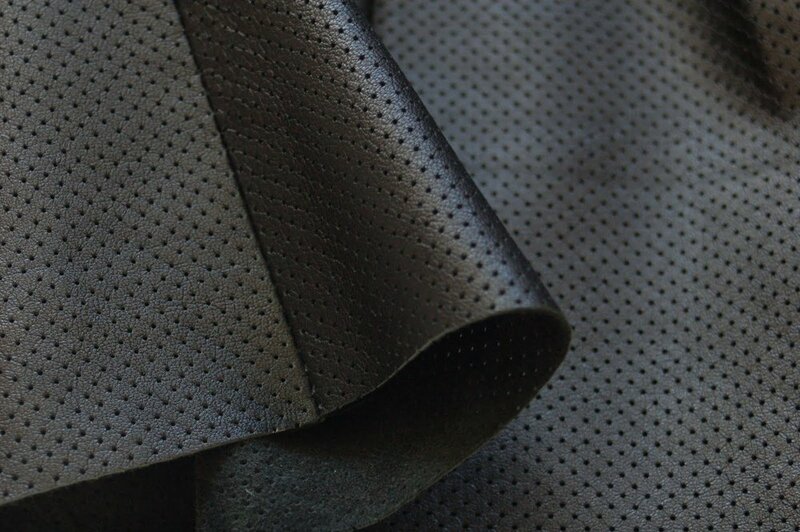 Using USA sourced carbon fiber fabric, we have exceptional skill in our variable application. Now for the first time ever we offer the Hexagonal "Wasp" on all our products. This extremely difficult and rare fiber is the first of its kind to be offered for steering wheel creation. This 2x2 twill weave is our most popular carbon fiber fabric. This 3K tow (3000 filiments per fiber) fabric provides outstanding structural strength with a signature appearance that is highly desirable for modern composite parts in the aerospace, auto, marine, and sporting goods industries. When compared to plain weave counterparts, the twill weave offers greater conformability, presents a beautiful herringbone texture, and delivers a slight edge in strength. In fact, our #1069 boasts an ultimate tensile strength of at least 610 KSI—most competitors offer only around 500 KSI. This hexagon pattern almost slithers across the fabric surface like a reptile, lending itself to a variety of interesting applications, like car hoods, water sports equipment, or even furniture. Patterned styles, like this interlocking honeycomb, not only create a unique look, but help to maximize the inherent strength properties of the carbon fibers from which they're made. Its pattern will not affect the ultimate tensile strength or stiffness.